Snow and ice buildup represent a serious concern for the structural integrity of residential roofing. 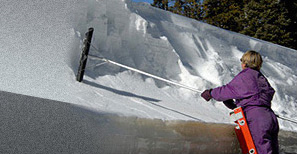 Because of temperature variations throughout the winter months, the freezing, melting, and refreezing of snow and ice can block water drainage, while ice buildup can damage gutters, eves, and shingles. At Heat Trace Products, LLC, our roof and gutter de-icing systems are designed with a self-regulating feature that provides heat only when needed, allowing unobstructed water drainage through its intended path. These systems are designed for residential and commercial applications and are UL approved. We have over 25 years of experience in self-regulating heating cable, and have provided systems and products for many extreme industrial environments. Heat Trace Products, LLC. roof and gutter de-icing systems are made from the same robust materials that can be found in industrial applications worldwide, delivering reliable long term protection against ice buildup. To learn more, see the information on this page or contact us directly.